They thought they could continue to abuse people with ever more taxes. But this last for climate change put them over the edge. 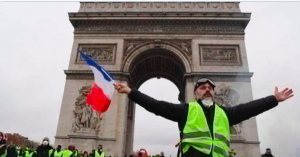 Jacline Mouraud, a self-proclaimed spokesperson for the so-called “yellow vest” protesters, told The Associated Press that Macron’s move “is on the right path but in my opinion it will not fundamentally change the movement.” She urged protesters to seize on the French government’s weakness to push other demands such as a rise in the minimum wage. More protests are planned for Saturday in Paris.